Robert James Lee Hawke, AC, GCL (born 9 December 1929) is an Australian former politician who was the 23rd Prime Minister of Australia and the Leader of the Labor Party from 1983 to 1991. He is the longest-serving Labor Party Prime Minister. Hawke was born in South Australia but moved to Western Australia as a child. He attended the University of Western Australia and then went on to Oxford University as a Rhodes Scholar. 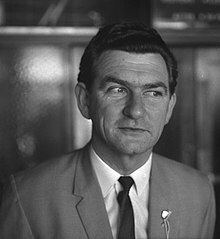 In 1956, Hawke joined the Australian Council of Trade Unions (ACTU) as a research officer. Having risen to become responsible for wage arbitration, he was elected ACTU President in 1969, where he achieved a high public profile. After a decade in that role, Hawke announced his intention to enter politics, and was immediately elected to the House of Representatives as the Labor MP for Wills. Three years later, he led Labor to a landslide victory at the 1983 election and was sworn in as Prime Minister. He led Labor to victory three more times, in 1984, 1987 and 1990, making him the most electorally successful Labor Leader. The Hawke Government created Medicare and Landcare, brokered the Prices and Incomes Accord, established APEC, floated the Australian dollar, deregulated the financial sector, introduced the Family Assistance Scheme, announced "Advance Australia Fair" as the official national anthem, initiated superannuation pension schemes for all workers and oversaw passage of the Australia Act that removed all remaining jurisdiction by the United Kingdom from Australia. 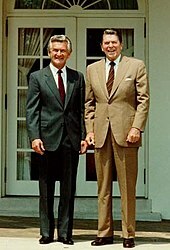 Hawke was replaced by his deputy Paul Keating at the end of 1991. Hawke remains Labor's longest-serving Prime Minister, Australia's third-longest-serving Prime Minister, and at the age of 89 years, 137 days, Hawke is the oldest living former Australian Prime Minister. Hawke is the only Australian Prime Minister to be born in South Australia, and the only one raised and educated in Western Australia. Hawke was born in Bordertown, South Australia, the second child of Arthur Hawke (1898–1989) (known as Clem), a Congregationalist minister, and his wife Edith Emily (Lee) (1897–1979) (known as Ellie), a schoolteacher. His uncle, Albert, was the Labor Premier of Western Australia between 1953 and 1959, and was also a close friend of Prime Minister John Curtin, who was in many ways Bob Hawke's role model. Hawke's elder brother Neil, who was seven years his senior, died at the age of seventeen after contracting meningitis, for which there was no cure at the time. Ellie Hawke subsequently developed an almost messianic belief in her son's destiny, and this contributed to Hawke's supreme self-confidence throughout his career. At the age of fifteen, he presciently boasted to friends that he would one day become the Prime Minister of Australia. At the age of seventeen, the same age that his brother Neil had died, Hawke had a serious accident while riding his Panther motorcycle that left him in a critical condition for several days. This near-death experience acted as his catalyst, driving him to make the most of his talents and not let his abilities go to waste. He joined the Labor Party in 1947 at the age of eighteen. Hawke was educated at Perth Modern School and the University of Western Australia, graduating in 1952 with a Bachelor of Arts and Bachelor of Laws. He was also president of the university's guild during the same year. 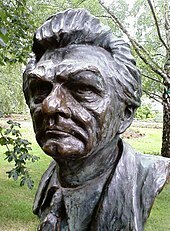 The following year, Hawke won a Rhodes Scholarship to attend University College, Oxford, where he undertook a Bachelor of Arts in Philosophy, Politics and Economics (PPE). He soon found he was covering much the same ground as he did in his education at the University of Western Australia, and transferred to a Bachelor of Letters. He wrote his thesis on wage-fixing in Australia and successfully presented it in January 1956. His academic achievements were complemented by setting a new world record for beer drinking; he downed 2 1⁄2 imperial pints (1.4 l) – equivalent to a yard of ale – from a sconce pot in 11 seconds as part of a college penalty. In his memoirs, Hawke suggested that this single feat may have contributed to his political success more than any other, by endearing him to an electorate with a strong beer culture. In 1956, Hawke accepted a scholarship to undertake doctoral studies in the area of arbitration law in the law department at the Australian National University in Canberra. Soon after his arrival at ANU, Hawke became the students' representative on the University Council. A year later, Hawke was recommended to the President of the Australian Council of Trade Unions (ACTU) to become a research officer, replacing Harold Souter who had become ACTU Secretary. The recommendation was made by Hawke's mentor at ANU, H.P. Brown, who for a number of years had assisted the ACTU in national wage cases. Hawke decided to abandon his doctoral studies and accept the offer, moving to Melbourne with his wife Hazel. Not long after Hawke began work at the ACTU, he became responsible for the presentation of its annual case for higher wages to the national wages tribunal, the Conciliation and Arbitration Commission. He was first appointed as an ACTU advocate in 1959. The 1958 case, under previous advocate R.L. Eggleston, had yielded only a five-shilling increase. The 1959 case found for a fifteen-shilling increase, and was regarded as a personal triumph for Hawke. He went on to attain such success and prominence in his role as an ACTU advocate that, in 1969, he was encouraged to run for the position of ACTU President, despite the fact that he had never held elected office in a trade union. He was elected ACTU President in 1969 on a modernising platform by the narrow margin of 399 to 350, with the support of the left of the union movement, including some associated with the Communist Party. He later credited Ray Gietzelt, General Secretary of the FMWU, as the single most significant union figure in helping him achieve this outcome. Hawke declared publicly that "socialist is not a word I would use to describe myself", and his approach to government was pragmatic. He concerned himself with making improvements to workers' lives from within the traditional institutions of government, rather than by using any ideological theory. He opposed the Vietnam War, but was a strong supporter of the US-Australian alliance, and also an emotional supporter of Israel. It was his commitment to the cause of Jewish Refuseniks which purportedly led to a planned assassination attempt on Hawke by the Popular Front for the Liberation of Palestine, and its Australian operative Munif Mohammed Abou Rish. In 1971, Hawke along with other members of the ACTU requested that South Africa send a non-racially biased team for the Rugby Union tour, with the intention of unions agreeing not to serve the team in Australia. Prior to arrival, the Western Australian branch of the Transport Workers Union, and the Barmaids' and Barmens' Union, announced that they would serve the team, which allowed the Springboks to land in Perth. The tour commenced on 26 June and riots occurred as anti-apartheid protesters disrupted games. Hawke and his family started to receive malicious mail and phone calls from people who thought that sport and politics should not mix. Hawke remained committed to the ban on apartheid teams and later that year, the South African cricket team was successfully denied and no apartheid team was to ever come to Australia again. It was this ongoing dedication to racial equality in South Africa that would later earn Hawke the respect and friendship of Nelson Mandela. In industrial matters, Hawke continued to demonstrate a preference for, and considerable skill at, negotiation, and was generally liked and respected by employers as well as the unions he advocated for. As early as 1972, speculation began that he would seek to enter Parliament and eventually run to become the Leader of the Labor Party. But while his professional career continued successfully, his heavy drinking and his notorious womanising placed considerable strains on his family life. In 1973, Hawke was elected as the Federal President of the Labor Party. Two years later, when the Whitlam Government was controversially dismissed by the Governor-General, Hawke showed an initial keenness to enter Parliament at the ensuing election. Harry Jenkins, the MP for Scullin, came under pressure to step down to allow Hawke to stand in his place, but he strongly resisted this push. Hawke eventually decided not to attempt to enter Parliament at that time, a decision he soon regretted. After Labor was defeated at the election, Whitlam initially offered the leadership to Hawke, although it was not within Whitlam's power to decide who would succeed him. Despite not taking on the offer, Hawke remained influential, playing a key role in averting national strike action. The strain of this period, serving as both ACTU President and Labor Party President, took its toll on Hawke and in 1979 he suffered a physical collapse. This shock led Hawke to publicly announce his alcoholism in a television interview, and that he would make a concerted – and ultimately successful – effort to overcome it. He was helped through this period by the relationship that he had established with writer Blanche d'Alpuget, who, in 1982, published a biography of Hawke. His popularity with the public was, if anything, enhanced by this period of rehabilitation, and opinion polling suggested that he was a far more popular public figure than either Labor Leader Bill Hayden or Liberal Prime Minister Malcolm Fraser. Hawke's first attempt to enter Parliament came during the 1963 federal election. He stood in the seat of Corio in Geelong and managed to achieve a 3.1% swing against the national trend, although he fell short of ousting longtime Liberal incumbent Hubert Opperman. Hawke passed up several opportunities to enter Parliament throughout the 1970s, something he later wrote that he "regretted". He eventually stood for election to the House of Representatives at the 1980 election for the safe Melbourne seat of Wills, winning it comfortably. Immediately upon his election to Parliament, Hawke was appointed to the Shadow Cabinet by Labor Leader Bill Hayden as Shadow Minister for Industrial Relations. Following his entry to Parliament, opinion polls continually indicated that, in contrast to Hayden, Hawke was regarded as "a certain election winner". Hayden, after having lost (albeit narrowly) the 1980 election, was increasingly subject to criticism from ALP figures concerning his leadership. In order to quell speculation over his position, Hayden eventually called a leadership ballot for 16 July 1982, believing that if he won he would be able to lead Labor into the next election. Hawke duly challenged Hayden, but Hayden was able to defeat him and remain in position, although his five-vote victory over the former ACTU President was not large enough to dispel doubts that he could lead the Labor Party to victory at an election. Despite being defeated, Hawke continued to agitate behind the scenes for a change in leadership, with opinion polls continuing to show that Hawke was a far more popular figure than both Hayden and Prime Minister Malcolm Fraser. Hayden was further weakened after the ALP's unexpectedly poor performance at a by-election in December 1982 for the Victorian seat of Flinders, following the resignation of the former Liberal Minister Sir Phillip Lynch. Labor needed a swing of 5.5% to win the seat, and had been predicted by the media to win, but could only achieve a swing of 3%. This convinced many Labor MPs that only Hawke would be able to lead Labor to victory at the upcoming election. Labor Party power-brokers, such as Graham Richardson and Barrie Unsworth, now openly switched their allegiance from Hayden to Hawke. More significantly, Hayden's staunch friend and political ally, Labor's Senate Leader John Button, had become convinced that Hawke's chances of victory at an election were greater than Hayden's. Initially Hayden believed that he could remain in his job, but Button's defection proved to be the final straw in convincing Hayden that he would have to resign as Labor Leader. Less than two months after the disastrous result at the Flinders by-election, Hayden announced his resignation as Leader of the Labor Party to the caucus on 3 February 1983. Hawke was subsequently named as leader—and hence became Leader of the Opposition—pending a party-room ballot at which he was elected unopposed. Having learned about the impending change, on the same day Fraser called a snap election for 5 March 1983, hoping to capitalise on Labor's feuding before it could replace Hayden with Hawke. However, he was unable to have the Governor-General confirm the election before Labor announced the change. In the election held a month later, Hawke led Labor to a landslide election victory, achieving a 24-seat swing—still the worst defeat that a sitting non-Labor Government has ever suffered—and ending seven years of Liberal Party rule. 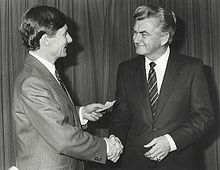 Hawke presenting a relief cheque to John Bannon, Premier of South Australia, in April 1983, in the aftermath of the Ash Wednesday fires. After Labor's landslide victory, Hawke was sworn in as the 23rd Prime Minister of Australia by the Governor-General on 11 March 1983. The inaugural days of the Hawke Government were distinctly different from those of the Whitlam Government. Rather than immediately initiating extensive reform programmes as Whitlam had, Hawke announced that Malcolm Fraser's pre-election concealment of the budget deficit meant that many of Labor's election commitments would have to be deferred. As part of his internal reforms package, Hawke divided the Government into two tiers, with only the most senior ministers sitting in the Cabinet. The Labor caucus was still given the authority to determine who would make up the Ministry, but gave Hawke unprecedented powers for a Labor Prime Minister to select which individual ministers would comprise the 13-strong Cabinet. Hawke said that he did this in order to avoid what he viewed as the unwieldy nature of the Whitlam Cabinet, which had 27 members. Caucus under Hawke also exhibited a much more formalised system of parliamentary factions, which significantly altered the dynamics of caucus operations. Unlike his predecessor, Hawke's authority within the Labor Party was absolute. This enabled him to persuade his MPs to support a substantial set of policy changes. Individual accounts from ministers indicate that while Hawke was not usually the driving force behind individual reforms, he took on the role of achieving consensus and providing political guidance on what was electorally feasible and how best to sell it to the public, tasks at which he proved highly successful. Hawke took on a very public role as Prime Minister, proving to be incredibly popular with the Australian electorate; to this date he still holds the highest ever AC Nielsen approval rating. According to political commentator Paul Kelly, "the most influential economic decisions of the 1980s were the floating of the Australian dollar and the deregulation of the financial system". Although the Fraser Government had played a part in the process of financial deregulation by commissioning the 1981 Campbell Report, opposition from Fraser himself had stalled the deregulation process. When the Hawke Government implemented a comprehensive program of financial deregulation and reform, it "transformed economics and politics in Australia". The Australian economy became significantly more integrated with the global economy as a result, which completely transformed its relationship with Asia, Europe and the United States. Both Hawke and Keating would claim the credit for being the driving force behind the success of the Australian Dollar float. That year the economy was seen to be in crisis with a 40% devaluation of the Australian dollar, a marked increase in the current account deficit and the loss of the Federal Government's triple A rating. Among other reforms, the Hawke Government dismantled the tariff system, privatised state sector industries, ended the subsidisation of loss-making industries, and sold off the state-owned Commonwealth Bank of Australia, Optus, Qantas and CSL Limited. The tax system was reformed, with the introduction of a fringe benefits tax and a capital gains tax, reforms strongly opposed by the Liberal Party at the time, but not ones that they reversed when they eventually returned to office. Partially offsetting these imposts upon the business community – the "main loser" from the 1985 Tax Summit according to Paul Kelly – was the introduction of full dividend imputation, a reform insisted upon by Keating. Funding for schools was also considerably increased, while financial assistance was provided for students to enable them to stay at school longer. Considerable progress was also made in directing assistance "to the most disadvantaged recipients over the whole range of welfare benefits." The political partnership between Hawke and his Treasurer, Paul Keating, proved essential to Labor's success in government. The two men proved a study in contrasts: Hawke was a Rhodes Scholar; Keating left high school early. Hawke's enthusiasms were cigars, horse racing and all forms of sport; Keating preferred classical architecture, Mahler symphonies and collecting British Regency and French Empire antiques. Hawke was consensus-driven; Keating revelled in aggressive debate. Hawke was a lapsed Protestant; Keating was a practising Catholic. These differences, however, seemed only to increase the effectiveness of their partnership, as they oversaw sweeping economic and social changes throughout Australia. In spite of the criticisms levelled against the Hawke Government, it succeeded in enacting a wide range of social reforms during its time in office. Deflecting arguments that the Hawke Government had failed as a reform government, Neville Wran, John Dawkins, Bill Hayden and Paul Keating made a number of speeches throughout the 1980s arguing that the Hawke Government had been a recognisably reformist government, drawing attention to Hawke's achievements as Prime Minister during his first five years in office. As well as the reintroduction of Medibank, under the new name Medicare, these included the doubling of the number of childcare places, the introduction of occupational superannuation, a boost in school retention rates, a focus on young people's job skills, a doubling of subsidised homecare services, the elimination of poverty traps in the welfare system, a 50% increase in public housing funds, an increase in the real value of the old-age pension, the development of a new youth support program, the reintroduction of six-monthly indexation of single-person unemployment benefits, and significant improvements in social security provisions. As pointed out by John Dawkins, the proportion of total government outlays allocated to families, the sick, single parents, widows, the handicapped, and veterans was significantly higher under the Hawke Government than under the Whitlam Government. In 1989, the Hawke Labor Government gradually re-introducing fees for university study. It set up the Higher Education Contributions Scheme (HECS), which was first proposed by Professor Murray Wells and subsequently developed by economist and lecturer at the Australian National University, Bruce Chapman and championed by Education Minister John Dawkins (see Dawkins Revolution). Under the original HECS, a $1,800 fee was charged to all university students, and the Commonwealth paid the balance. A student could defer payment of this HECS amount (in which case it was called a HECS debt) and repay the debt through the tax system, when the student's income exceeds a threshold level. As part of the reforms, Colleges of Advanced Education entered the University sector by various means. The HECS system was accepted by both federal political parties and has survived until today, though with a number of changes. Another notable success for which Hawke's response is given considerable credit was Australia's public health campaign regarding HIV/AIDS. In the later years of the Hawke Government, Aboriginal affairs also saw considerable attention, with an investigation of the idea of a treaty between Aborigines and the Government, although this idea would be overtaken by events, notably the Mabo court decision. The Hawke Government also made some notable environmental decisions. In its first months in office, it halted the construction of the Franklin Dam in Tasmania, responding to a groundswell of protest about the issue. In 1990, with an election looming, tough political operator Graham Richardson was appointed Environment Minister, and was given the task of attracting second-preference votes from the Australian Democrats and other environmental parties. Richardson claimed this as a major factor in the government's narrow re-election at the 1990 election. Richardson felt that the importance of his contribution to Labor's victory would automatically entitle him to the ministerial portfolio of his choice, which was Transport and Communications. He was shocked, however, at what he perceived as Hawke's ingratitude in allocating him Social Security instead. He later vowed in a telephone conversation with Peter Barron, a former Hawke staffer, to do "whatever it takes" to "get" Hawke. He immediately transferred his allegiance to Paul Keating, who after seven years as Treasurer was openly coveting the leadership. 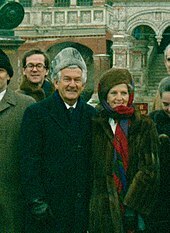 Hawke and his first wife, Hazel, on a 1987 trip to Moscow. 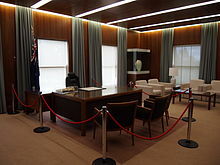 The Prime Minister's Office at Old Parliament House, Canberra, preserved as it appeared during Hawke's prime ministership; he was the last prime minister to work there before the opening of the new building in 1988. Hawke benefited greatly from the disarray into which the Liberal Party fell after the resignation of Malcolm Fraser. The Liberals were divided between supporters of the dour, socially conservative John Howard and the more liberal, urbane Andrew Peacock. The arch-conservative Premier of Queensland, Joh Bjelke-Petersen, added to the Liberals' problems with his "Joh for Canberra" campaign, which proved highly damaging. Exploiting these divisions, Hawke led the Labor Party to landslide election victories in a snap 1984 election and the 1987 election. Hawke's tenure as Prime Minister saw considerable friction develop between himself and the grassroots of the Labor Party, who were unhappy at what they viewed as Hawke's iconoclasm and willingness to cooperate with business interests. All Labor Prime Ministers have at times engendered the hostility of the organisational wing of the Party, but none more so than Hawke, who regularly expressed his willingness to cull Labor's "sacred cows". The Socialist Left faction, as well as prominent Labor figure Barry Jones, offered severe criticism of a number of government decisions. He also received criticism for his "confrontationalist style" in siding with the airlines in the 1989 Australian pilots' strike. The late 1980s recession and accompanying high interest rates had seen the government in considerable polling trouble, with many doubting if Hawke could win in 1990. Although Keating was the main architect of the government's economic policies, he took advantage of Hawke's declining popularity to plan a leadership challenge. In 1988, in the wake of poorer opinion polls, Keating put pressure on Hawke to step down immediately. Hawke responded by agreeing a secret deal with Keating, the so-called "Kirribilli agreement", that he would stand down in Keating's favour shortly after the 1990 election, which he convinced Keating he could win. Hawke duly won the 1990 election, albeit by a very tight margin, and subsequently appointed Keating as Deputy Prime Minister to replace the retiring Lionel Bowen, and to prepare Keating to assume the leadership. Not long after becoming Deputy Prime Minister, frustrated at the lack of any indication from Hawke as to when he might step down, Keating made a provocative speech to the Federal Parliamentary Press Gallery. Hawke considered the speech extremely disloyal, and subsequently indicated to Keating that he would renege on the Kirribilli Agreement as a result. After this disagreement, tensions between the two men reached an all-time high, and after a turbulent year, Keating finally resigned as Deputy Prime Minister and Treasurer in June 1991, to challenge Hawke for the leadership. Hawke comfortably defeated Keating, and in a press conference after the result Keating declared that with regards the leadership, he had fired his "one shot". Hawke appointed John Kerin to replace Keating as Treasurer, but Kerin quickly proved to be unfit for the job. Despite his convincing victory over Keating, Hawke was seen after the result as a "wounded" leader; he had now lost his long-term political partner, his rating in opinion polls began to decrease, and after nearly nine years as prime minister, many were openly speculating that he was "tired", and that it was time for somebody new. Hawke's leadership was finally irrevocably damaged towards the end of 1991, as new Liberal Leader John Hewson released 'Fightback! ', a detailed proposal for sweeping economic change, including the introduction of a goods and services tax and deep cuts to government spending and personal income tax. The package appeared to take Hawke by complete surprise, and his response to it was judged to be extremely ineffective. Many within the Labor Party appeared to lose faith in him over this, and Keating duly challenged for the leadership a second time on 19 December 1991, this time narrowly defeating Hawke by 56 votes to 51. In a speech to the House of Representatives the following day, Hawke declared that his nine years as Prime Minister had left Australia a better country than he found, and he was given a standing ovation by those present. He subsequently tendered his resignation as Prime Minister to the Governor-General. Hawke briefly returned to the backbenches before resigning from Parliament on 20 February 1992, sparking a by-election which was won by the independent candidate Phil Cleary from a record field of 22 candidates. Hawke wrote that he had very few regrets over his time in office; although his bitterness towards Keating surfaced in his earlier memoirs, by 2008, Hawke claimed that he and Keating had long since buried their differences, and that they regularly dined together and considered each other friends. However, in 2010, the publication of the book Hawke: The Prime Minister, by Hawke's second wife, Blanche d'Alpuget, reignited conflict between the two. In an open letter to Hawke published in Australian newspapers, Keating bitterly accused Hawke and d'Alpuget of spreading falsehoods about his role in Hawke's premiership. He declared that "in hindsight, it is obvious yours and Blanche's expressions of friendship towards me over the last few years have been completely insincere." After leaving Parliament, Hawke entered the business world, taking on a number of directorships and consultancy positions which enabled him to achieve considerable financial success. He deliberately had little involvement with the Labor Party during Keating's tenure as Prime Minister, not wanting to overshadow his successor, although he did occasionally criticise some of Keating's policies publicly. After Keating's defeat and the election of the Howard Government at the 1996 election, he began to be more involved with Labor, regularly appearing at a number of Labor election launches and campaigns, often alongside Keating. 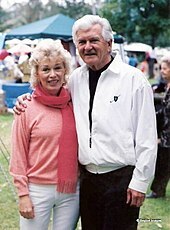 In 2002, Hawke was named an honorary member of South Australia's Economic Development Board during Rann's Labor government. In the run up to the 2007 election, Hawke made a considerable personal effort to support Kevin Rudd, making speeches at a large number of campaign office openings across Australia. As well as campaigning against WorkChoices, Hawke also attacked John Howard's record as Treasurer, stating "it was the judgement of every economist and international financial institution that it was the restructuring reforms undertaken by my government, with the full cooperation of the trade union movement, which created the strength of the Australian economy today". Similarly, in the 2010 and 2013 campaigns, Hawke lent considerable support to Julia Gillard and Kevin Rudd respectively. Hawke also maintained an involvement in Labor politics at a state level; in 2011, Hawke publicly supported New South Wales Premier Kristina Keneally, who was facing almost certain defeat, in her campaign against Liberal Barry O'Farrell, describing her campaign as "gutsy". In February 2008, Hawke joined former Prime Ministers Gough Whitlam, Malcolm Fraser and Paul Keating in Parliament House to witness Prime Minister Kevin Rudd deliver the long anticipated apology to the Stolen Generations. In 2009, Hawke helped establish the Centre for Muslim and Non-Muslim Understanding at the University of South Australia. Interfaith dialogue was an important issue for Hawke, who told the Adelaide Review that he is "convinced that one of the great potential dangers confronting the world is the lack of understanding in regard to the Muslim world. Fanatics have misrepresented what Islam is. They give a false impression of the essential nature of Islam." In 2016, after taking part in Andrew Denton's Better Off Dead podcast, Hawke added his voice to calls for voluntary euthanasia to be legalised. Hawke labelled as 'absurd' the lack of political will to fix the problem. He revealed that he had such an arrangement with his wife Blanche should such a devastating medical situation occur. He also publicly advocated for nuclear power and the importation of international spent nuclear fuel to Australia for storage and disposal. In late December 2018, Hawke revealed that he was in "terrible health" and while predicting a Labor win in the upcoming 2019 election, Hawke said he "may not witness the party's success". Hawke married Hazel Masterson in 1956 at Perth Trinity Church. They had three children; Susan (born 1957), Stephen (born 1959) and Roslyn (born 1960). Their fourth child, Robert Jr, died in his early infancy in 1963. Hawke was named Victorian Father of the Year in 1971, a charge which his wife disputed due to his heavy drinking and womanizing. The couple divorced in 1995, after he left her for the writer Blanche d'Alpuget, and the two currently live together in Northbridge, a suburb of the North Shore of Sydney. On the subject of his religion, Hawke previously wrote, while attending the 1952 World Christian Youth Conference in India, that "there were all these poverty stricken kids at the gate of this palatial place where we were feeding our face and I just had this struck by this enormous sense of irrelevance of religion to the needs of people". He subsequently abandoned his Christian beliefs. By the time he entered politics he was a self-described agnostic. Hawke told Andrew Denton in 2008 that his father's Christian faith had continued to influence his outlook, saying "My father said if you believe in the fatherhood of God you must necessarily believe in the brotherhood of man, it follows necessarily, and even though I left the church and was not religious, that truth remained with me." Throughout his marriage to his first wife, Hazel, Hawke was a heavy drinker. Hawke suffered from alcohol poisoning following the death of their infant son. Hawke carried on an extramarital affair with his biographer, Blanche d'Alpuget. Hawke left his wife for Blanche, a move which left him estranged from some of his family for a time. Hawke and his family reconciled by the 2010s. 1989: Knight Grand Cordon of the Order of the White Elephant. 2008 Grand Companion of the Order of Logohu, Papua New Guinean Prime Minister Sir Michael Somare informed Hawke that he was being honoured for his "support for Papua New Guinea ... from the time you assisted us in the development of our trade union movement, and basic workplace conditions, to the strong support you gave us during your term as Prime Minister of Australia". 2012 Grand Cordon of the Order of the Rising Sun. 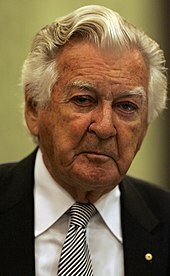 August 2009: Australian Labor Party Life membership, Bob Hawke became only the third person to be awarded life membership of the Australian Labor Party, after Gough and Margaret Whitlam. During the conferration, Prime Minister Kevin Rudd referred to Hawke as "the heart and soul of the Labor Party". March 2014: University of Western Australia Student Guild Life membership. A biographical television film, Hawke, premiered on the Ten Network in Australia on 18 July 2010, with Richard Roxburgh playing the title character. Rachael Blake and Felix Williamson portrayed Hazel Hawke and Paul Keating respectively. ^ "Australia Act (Commencement) Order 1986" (PDF). Retrieved 23 January 2016. ^ Iyer, Pico (14 March 1983). "Australia: Hawke Swoops into Power, Time/CNN, 14 March 1983". Time. Retrieved 25 April 2010. ^ D'Alpuget, Blanche (1982). Robert .J. Hawke: A biography, p. 31. Schwartz, Melbourne. ISBN 0867530014. ^ "Australia's Prime Ministers: Robert Hawke". National Archives of Australia. 2014. Archived from the original on 12 September 2009. Retrieved 7 April 2014. ^ "Bob Hawke qualifies for cheap coffee on campus | University News : The University of Western Australia". News.uwa.edu.au. 27 March 2014. Retrieved 19 May 2017. ^ Bob Hawke (1994). The Hawke Memoirs. Heinemann. p. 28. Retrieved 28 June 2011. ^ "Media Man Australia: The Online Home of Greg Tingle, Journalist & TV Presenter". Mediaman.com.au. 3 December 2003. Retrieved 25 April 2010. ^ "Vale Ray Gietzelt". United Voice. Archived from the original on 7 April 2015. Retrieved 28 July 2015. ^ Nicholson, Brendan (31 December 2006). "Terrorists plotted Hawke assassination: ASIO". The Age. Melbourne. Retrieved 25 April 2010. ^ D'Alpuget, Blanche (1982). Robert .J. Hawke: A biography, p. 192. Schwartz, Melbourne; ISBN 0867530014. ^ "Australia and the issue of apartheid in sport". National Archives of Australia. 2014. Retrieved 7 April 2014. ^ "1971 Springbok tour: When campaigners scored a victory against racism". Solidarity Magazine. 2011. Retrieved 7 April 2014. ^ "The biggest hammering in history". The Sydney Morning Herald. 20 May 2008. Retrieved 20 May 2008. ^ "ParlInfo – Australian Labor party: record of achievements 1983–1990". Retrieved 28 July 2015. ^ "Achievements of the Federal Labor Government – 1983–1986". Pandora.nla.gov.au. 23 August 2006. Archived from the original on 18 July 2001. Retrieved 22 May 2011. ^ "Wran/1986 The Great Tradition-Labor Reform from Curtin to Hawke". John.curtin.edu.au. Retrieved 22 May 2011. ^ "Higher Education Funding Act 1988". Austlii.edu.au. 1 January 2005. Retrieved 27 August 2010. ^ Hawke (1994), p.501. This was the speech in which Keating described himself as the 'Plácido Domingo' of Australian politics. ^ Gordon, Michael (16 July 2010). "True rivals". The Sydney Morning Herald. Retrieved 11 March 2018. ^ "Hawke: After office". Prime Ministers of Australia: National Archives of Australia. Government of Australia. 20 February 1992. Retrieved 22 May 2011. ^ "Hawke and Keating bury the hatchet". Australia: ABC News. 13 July 2008. Retrieved 25 April 2010. ^ "Paul Keating hits back: 'Hawke only survived as PM with my help'". The Australian. 15 July 2010. Retrieved 9 August 2016. ^ 1994 Year in Review – Australia Encyclopædia Britannica online. Retrieved 17 May 2017. ^ "Mayor welcomes economic development board". ABC News. 9 September 2004. Retrieved 3 March 2019. ^ "A report by the Economic Development Board March 2009" (PDF). South Australia Economic Development Board. 2009. Retrieved 3 March 2019. ^ Ker, Peter; Grattan, Michelle (24 October 2007). "Hawke queries record of man who 'buggered' the economy". The Age. Melbourne. Retrieved 25 April 2010. ^ ABC, News (24 March 2011). "Hawke praises Keneally's 'gutsy' Campaign". ABC News. Retrieved 26 January 2012. ^ Welch, Dylan (13 February 2008). "Kevin Rudd says sorry". The Sydney Morning Herald. Retrieved 22 February 2008. ^ Ward, Amanda (December 2009). "World peace and a republic". Adelaide Review (358). pp. 6–7. Archived from the original on 22 February 2011. Retrieved 14 March 2010. ^ Kelly, Fran. "Bob Hawke on voluntary euthanasia and 'losing his marbles'". Radio National Breakfast (Thursday 14 April 2016). Retrieved 17 August 2016. ^ Koziol, Michael (14 April 2016). "Absurd: Bob Hawke blasts lack of political will to legalise euthanasia". The Sydney Morning Herald (14 April 2016). Retrieved 17 August 2016. ^ "Bob Hawke pushes nuclear power at Woodford Folk Festival". ABC News. 28 December 2016. Retrieved 27 December 2017. ^ Butler, Josh (1 January 2016). "Bob Hawke Says Nuclear Waste Dump 'A Win-Win' For Australia". HuffPost. Retrieved 27 December 2017. ^ "Bob Hawke reveals 'terrible health' as he tips Labor to win federal election". ABC. Retrieved 29 December 2018. ^ D'Alpuget, Blanche (1982). Robert .J. Hawke: A biography, p. 197. Schwartz, Melbourne. ISBN 0867530014. ^ a b "The transformation of Hazel Hawke". NewsComAu. Retrieved 25 August 2018. ^ "Carte Blanche". Syney Morning Herald. Retrieved 22 August 2017. ^ "Elders Part 5: Bob Hawke". Elders with Andrew Denton. 11 January 2010. ^ "ENOUGH ROPE with Andrew Denton – episode 176: Elders Part 5 – Bob Hawke (14/07/2008)". Australian Broadcasting Corporation. 14 July 2008. Retrieved 31 July 2012. ^ "Bob Hawke speaks about his final visit to first wife Hazel". ABC News. 17 November 2014. Retrieved 25 August 2018. ^ "It's an Honour". Government of Australia. Retrieved 3 September 2007. ^ Wright, Tony (25 March 2014). "Tony Abbott's Bunyip Aristocracy: arise, Lord Clive and Lady Gina". Sydney Morning Herald. Retrieved 3 March 2019. ^ a b "The Honourable Bob Hawke AC CGL" (PDF). University of Sydney. 9 December 2016. Retrieved 3 March 2019. ^ "ALP life membership for Bob Hawke". News.com.au. 1 August 2009. Retrieved 18 July 2010. ^ "Bob Hawke qualifies for cheap coffee on campus". news.uwa.edu.au/. 27 March 2014. Retrieved 22 September 2016. ^ a b c d e f g h "1990 and 1991 – Hawke government". National Archives of Australia. Retrieved 3 March 2019. ^ "The Hawke Government's China Policy". Australia-China Relations Institute. Retrieved 3 March 2019. ^ "Oxford honours Hawke". The Age. AAP. 4 July 2003. Retrieved 3 March 2019. ^ a b c d e "Bob Hawke biography". UniSA. Archived from the original on 31 August 2007. Retrieved 15 December 2007. ^ "Honorary Doctorate Awarded to Bob Hawke" (Press release). 18 September 2013. Retrieved 3 March 2019. ^ "The Bob Hawke Prime Ministerial Library". UniSA. Archived from the original on 19 August 2006. Retrieved 3 September 2007. ^ "Newsroom Honorary doctorate awarded to Bob Hawke – Macquarie University". Retrieved 28 July 2015. ^ Mangan, John (19 July 2009). "Capturing the life, times and hair of Hawke". The Age. Retrieved 3 March 2019. ^ Enker, Debi (15 July 2010). "Nailing the Silver Bodgie". Sydney Morning Herald. Retrieved 3 March 2019. Anson, Stan (1991). Hawke: An Emotional Life. Macphee Gribble. Bramston, Troy; Ryan, Susan (2003). The Hawke Government : A Critical Retrospective. Pluto. ISBN 1-86403-264-2.
d'Alpuget, Blanche (1982). Robert J Hawke. Schwartz. ISBN 0-86753-001-4. Davidson, Graham; Hirst, John; MacIntyre, Stuart (1998). The Oxford Companion to Australian History. Oxford University Press. ISBN 0-19-553597-9. Edwards, John (1996). Keating, The Inside Story. Penguin. ISBN 0-14-026601-1. Hawke, Bob (1994). The Hawke Memoirs. Heinemann. ISBN 0-85561-502-8. Hurst, John (1983). Hawke PM. Angus & Robertson. ISBN 0-207-14806-6. Jaensch, Dean (1989). The Hawke-Keating Hijack. Allen and Unwin. ISBN 0-04-370192-2. Kelly, Paul (1992). The End of Certainty: The story of the 1980s. Allen & Unwin. ISBN 1-86373-227-6. Mills, Stephen (1993). The Hawke Years. Viking. ISBN 0-670-84563-9. Richardson, Graham (1994). Whatever It Takes. Bantam. ISBN 1-86359-332-2. 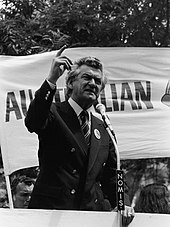 Wikimedia Commons has media related to Bob Hawke.